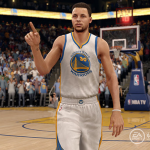 A new roster has come through for NBA Live 16, accompanied by the usual blog post over on the official website detailing all of the changes and updates. The new roster accounts for recent player movement, and adds a couple of missing players to the game. Earl Watson, Ray Allen, and Benjamin Anthony have also been removed from the active rosters, a couple of jersey numbers have been updated, and new gear has been assigned for 31 players. Kevin Durant, James Harden, and DeMarcus Cousins are also currently rated 91 overall. Draymond Green is sitting at 90 overall in the latest roster, for a total of nine players rated 90+ overall. As previously noted, this is less than half the number of players rated 90 or more in the default rosters of NBA Live 16, which in my opinion is a good change. If you have any feedback on the latest roster, feel free to post it in the comments section below, as well as in this thread in the NBA Live 16 section of the NLSC Forum. Once again, we’ve also tipped off our Wishlist for NBA Live 17, so be sure to get involved here.